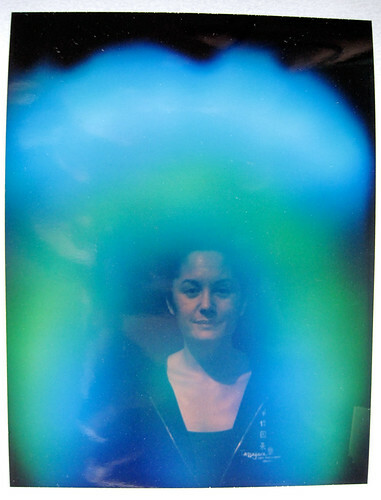 i got my AURA picture taken, awesome! it's not exactly the same colors as my polaroid but it's pretty close. i would say the actual polaroid is a brighter blue and the green is a bit darker. Blue is the energy of the spiritual teacher. Blue also represents one who is intuitive, sensitive, patient and kind. Blue is a very cool and soothing color that can relieve tension and reduce fevers. Under Blue's protective energy, we can find inner peace, contentment and true joy in living. Blue opens the Throat (Vishuddha) chakra and teaches us to own our voice and to speak our Truth with quiet integrity." and green = Green is the healer and the nurturer of life. This is the color of the forests and the rich, productive valleys of the Earth plane. In Green, we are deeply rooted and in balance with all other life forms. Here is the energy that sparks our imagination and creativity. Green in the Aura signifies someone who takes great pleasure in life's simple gifts. Green opens the Heart (Anahata) chakra and guides us to be giving. it's pretty even, so i'm pretty balanced it seems. today i have been on my computer since 8am, and it's now 3. i have to still go through the wedding pictures and bday dinner pics. oye.